A woman with an idea. That was me in November, 2009. At the University of Texas at Austin, they had launched a new platform to solicit feedback and ideas from the University community. On the day it launched, I happened to walk by two large raised beds, filled with flowers that were being dug up so that Landscape Services could replant them with winter-hardy annuals. It was a ritual the University had engaged in as long as I had worked here, and I was fed up. It seemed like such a poor use of landscaper staff time, not to mention a really bad gardening practice, to plant non-native flowers that can barely make it through a season, only to replace them seasonally with other flowers that could only squeak through the next season. On a more personal note, it seemed wasteful and sad to see a lot of plants dug up and thrown away. It also bothered me that cheap bedding plants were the best the University had come up for these large beds right in the heart of campus. And let’s get real. 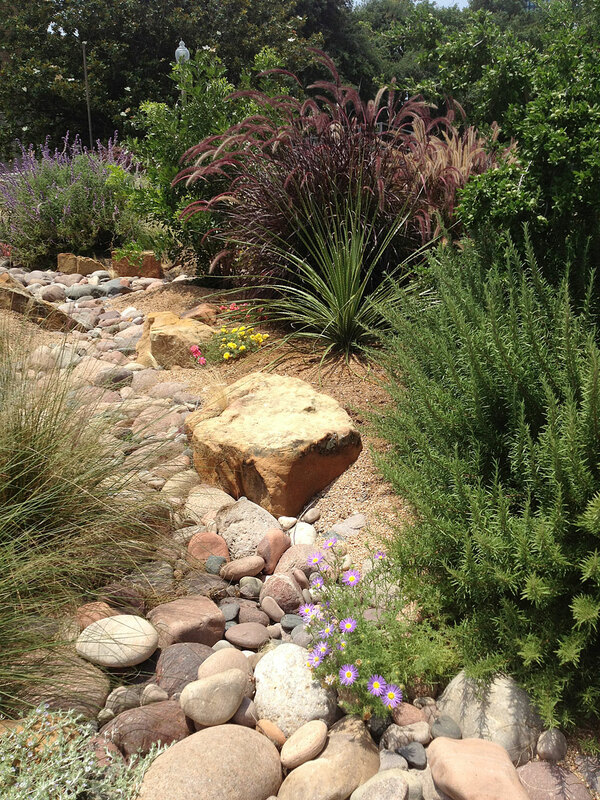 Austin is increasingly a “green” city, and xeriscaping is increasingly popular. 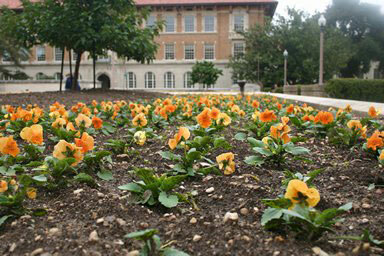 So why was UT Austin wasting its time planting and then digging up pansies of all things? So that very day I tossed a suggestion to the new suggestion forum called The Ideas of Texas. Initially it was just a way to blow off steam because these gardens had been a sore point for a long time. Little did I know they would actually like the idea. In fact, the University liked it so much that they decided to implement it, and worked with me to make it happen. I got to meet a couple times with representatives of Landscape Services and experts from the Ladybird Johnson Wildflower Center to discuss the idea and the kinds of plants that could go into the beds. President Powers even featured the idea on his blog Tower Talk! 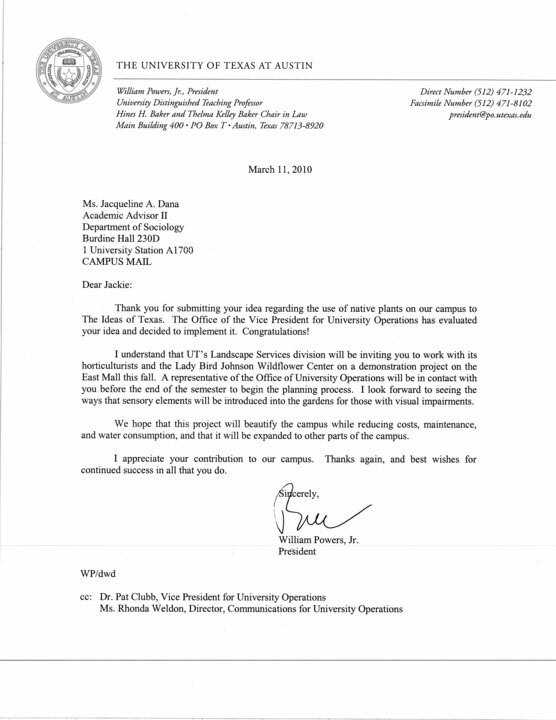 It took nearly a year to get the landscaping plans drawn up and approved, and then for the University to secure the plants and other supplies needed, and then to actually plant the garden. Oh and factor in University time because nothing happens overnight on a large campus. So the idea came to me in November 2009, but it wasn’t until December 2010 that the garden was actually planted. 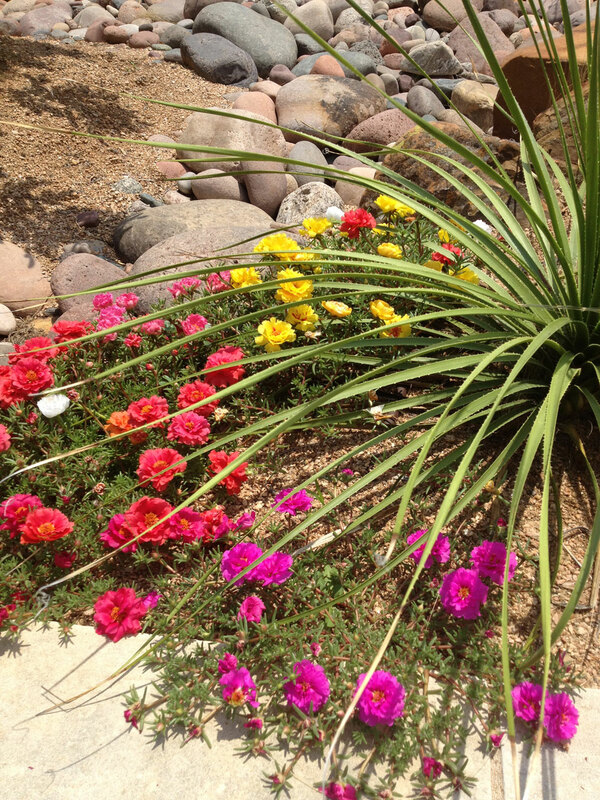 Instead of pansies, there’s now a gorgeous garden with native perennials, flowers and grasses. It’s gorgeous and needs very little care other than a bit of water from time to time. Every time I walk by it, my heart swells with pride. That’s MY garden, my legacy to the University of Texas at Austin. And it’s a beautiful thing indeed. 1. When you have an idea that can make a difference, it’s always worth throwing it out there, even if you work at a huge institution like UT Austin. Someone might actually listen. 2. Always encourage and promote sustainable gardening practices whenever you can. Start with your own home, then maybe talk to your neighbors, local businesses, city park departments. Then hit up the large corporations, college campuses, and other areas with large green areas soaked with Roundup and drenched with water just to keep the grass green. What an AWESOME, amazing story!!! Most of the time, it’s easy to not bother saying anything because you don’t think anyone is really listening. Too cool… Thanks for sharing. Wow, Jackie, way to go! Living in Houston, I see the same landscarping practices you mentioned; seasonally pulling out and destroying perfectly healthy plants in favor of freshly blooming ones. I’m going to fashion a letter that I can send out with your idea, and supply your website’s link for reference. I live with great concerns about responsible water consumption, as well as the use of pesticides and herbicides to keep non-native species alive and well in foreign landscapes. Your solution is practical, and could potentially contribute to better landscaping practices. Kudos, and thank you for sharing this!